Geography/Culture: Pre-dynastic Egyptian. She had temples at Thebes, Deir el-Bahri, at the site of Hatshepsut's tomb and at Karnak. Description: Domestic and protective Mother Goddess of pregnancy, childbirth and maternity; She Who assists at the daily rebirth of the sun; the Eye of Ra; Protectress of the dead ensuring their rebirth into the land of the dead; Mistress of the Deities; Bearer of the Gods. Icon: She is represented as a pregnant hippopotamus with large udders standing on Her hind-legs, Her left fore-foot resting on the sa. Or: She is represented with the head of a hippopotamus, back and tail of a crocodile, the pendant breasts of a woman and legs of a lion. She sometimes holds a torch in Her right and ankh as well as sa in Her left forefoot. Her image was attached to beds, headrests and cosmetic articles. 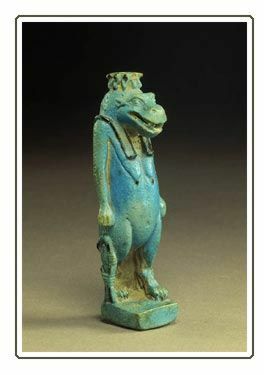 To whom are sacred: hippotamus (is which She is manifest); crocodile; lion; torch (expels typhonic forces); Sa -- symbol of protection and/or the magical fluid of life (variously described as: a stylized life-preserver, made of papyrus, worn by river travelers; a part of the Goddesses organs of generation; the herdsman's rolled up shelter of papyrus); perhaps whisk (which, in some images, She appears to be carrying). Male associate: Her consorts are most frequently Bes, `---'; sometimes Ra, `---'; sometimes Set, `---' (or Typhon) for which reason She later acquired an evil reputation. Son: Osiris, `ÄÄÄ', by Ra, ----. Transcription variant: Apt. These three names may all be transcription variants of Ta-Urt, below. She is often identified with Hat-Hor, qv. She is sometimes said to be the mother of Isis, qv, by Ra. Alternate name: Sheput, $]PUT, `---'. These names may perhaps both be transcription variants of Taurt, below.